Thank you to Dean Goss, who graciously allowed one of his wonderful waterfall photographs to be used in the Caledonia County, Vermont graphic logo. In 1791, Vermont joined the original 13 as a state in the union. On November 5, 1792, Caledonia County was incorporated from Orange County, including all that part of Vermont north of that county, and extending so far west as to include Montpelier and adjacent towns, however, the Caledonia County was not fully organized until November 8, 1796, when Danville was made the shire town. In 1811, the state of Vermont was divided into eleven counties and the counties of Orleans and Essex were incorporated from Caledonia County. In addition, in 1811, four towns from Caledonia County were incorporated into Washington County, to which Woodbury was also annexed, in 1836, and Cabot, in 1855. In 1856, the county seat was removed from Danville to St. Johnsbury where new county buildings were erected. Located in northeastern Vermont, with Essex County to the east, Washington and Orleans Counties to the west, and Orange County to the south, the communities within Caledonia County are found in the Towns Table which follows. Select from the TOWNS Table below to view information and links specific to a town / township. Select this LINK to see GENERAL Caledonia County information and links. Please note: Though the information on this web page is believed to be correct, the possibility of error remains. Please notify Ann Mensch should an error be found. Note regarding the 1790 U.S. Census of Vermont - Vermont joined the Union in March, 1791, so its 1790 census was actually taken in 1791. At that time, Vermont consisted of 7 counties. Present-day counties were later formed from all or portions of these seven counties. § History of Caledonia County and Towns: Part First. Gazetteer of Caledonia and Essex Counties, VT., 1764-1887, compiled and published by Hamilton Child. Syracuse, N. Y. : The Syracuse Journal Company, Printers and Binders, May, 1867. § Index to The Vermont Historical Gazetteer: A Local History of All the Towns in the State, transcribed by Rod Skinner (County Coordinator for Windham County, VTGenWeb), 2006. The VERMONT HISTORICAL GAZETTEER is a 5 volume set of historical information, by Abby Maria Hemenway, with Volume I published in 1867, and Volume V completed in 1891 after her death. Thank you! Thank you! to Rod Skinner!!! § Caledonia County [Vermont], by Abby Maria Hemenway, Ludlow, Vt.: Miss A. M. Hemenway, 1862. Ø Vermont Area Map of ca. 1756: An accurate map of His Majesty's Province of New-Hampshire in New England & all the adjacent country northward to the River St. Lawrence, & eastward to Penobscot Bay, containing the principal places which relate to the present war on the continent of North America. By Saml. Langdon (1723-1797). o This map shows the original Orange county from which Caledonia County was created in 1796. Ø Vermont Maps – Middlebury College digital collections. Ø Index to Names, Businesses, and Features, which appear in Caledonia County on the ca. 1858 atlas: "Map of Caledonia County, Vermont From Actual Surveys under the direction of H. F. Walling", New York : Baker & Tilden, 1858. Ø Use the query form, at USGS, to map features including cemeteries, churches, populated places, and more. Please note that the map town listed with a feature may be used as a map reference for the site, and may not be the town where the feature is actually located...Select a map to see the location of the actual feature. This database may not be complete, and, as with any database, there may be errors. Ø Vermont in the Civil War, by Tom Ledoux. 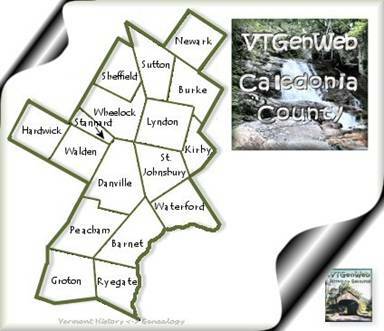 Would you like to post a query related to Caledonia County, Vermont? Visit the Rootsweb message board for Caledonia County, Vermont. Ø How to Obtain Vital Records for Vermont ? Ø Index to Vermont Vital Records, 1760-1954, (familysearch.org) – note this index may not be complete, some towns and records may not be included among state records. Ø Index to Vermont Vital Records, 1955-2003, (familysearch.org). Ø Vermont, Town Clerk, Vital and Town Records, 1732-2005, (familysearch.org) - Vital and town records acquired from local town clerk offices. Caledonia District Probate Court: P.O. Box 406, 27 Main Street, St. Johnsbury, VT 05819 Phone: (802) 748-6605. Caledonia County Clerk: 27 Main Street - St. Johnsbury, VT 05819-2637 Phone: (802) 748-6600. Return to Vermont History <-> Genealogy Main Page. Copyright 1998, 1999, 2000, 2001-2017, by Ann Mensch. All Rights Reserved.